Every so often I receive some surprise titles from Ideals Books. Earlier in the fall I was sent some books from the Grace Chapel Inn series, which are published by Ideals (i.e., Guidepost) and they looked like cozy reads. I tucked them away for Christmas time when I was sure I would want something peaceful to read. This series is interesting in that it is penned by several different authors including Melody Carlson (who wrote the first book in the series), Dana Corbit, Rebecca Kelly, Diann Hunt and Judy Baer (along with a few others!) There are quite a list of ladies who have created the town of Acorn Hill, a small fictional town in Pennsylvania. I wasn't sure how the series would read, exactly, being that there are so many authors with their pens in the pot. However, I think that it works. Odd, but it works! I read two of the five titles that I was sent, both of which were Christmas-related. 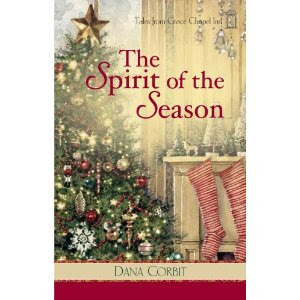 The first I read was The Spirit of the Season, Book 8) ! I checked with my rep to see what order I should be reading the book (since I hadn't been sent the first title by Carlson) and was told they could be easily read in any order. I assumed the best and plowed on in and was instantly delighted by the characters I met in Acorn Hill. The Grace Chapel Inn series revolves around the three Howard sisters: Alice, Louise and Jane. The three sisters have inherited their family's old Victorian home and have converted it into a Bed & Breakfast. The stories all seem to revolve around life at the B&B and documents the sisters' interactions with various town folk and travelers in need. They are heart warming tales, with an unabashed Christian message and make you want to book a night at a Bed & Breakfast yourself! In The Spirit of the Season the sisters' are saving marriages, counseling young couples, enjoying each other's company and planning for a quiet Christmas holiday which never comes to fruition. However, they wouldn't trade their unexpected busyness for all the good that comes of it. Next up I read Home for the Holidays which, from all I can tell, is Book 12 in the series and is penned by someone entirely different than the first book I read. I did not find it hard to jump back into the character's lives. There really was a great deal of continuity between the two books, although you could tell that each author had their strong points and characters which most intrigued them. Ultimately though, the characters remained constant and steady in their personality and individual stories and I wasn't lost at all. I think it's very true that you can read these books in any order. I find it rather difficult to describe the Grace Chapel Inn books because they are so different than something I think you might usually find. If you decide you'd like to pick up this series, check them out on Amazon because they are handily numbered so that you can tell what order the books were published in. I think I would have liked to have read them that way, but only because my brain won't let me think of hop skipping around a series like I did this one. That said, I certainly am not found wanting in the story department. They definitely caught me off guard but I found them altogether pleasant and am happy to point them out to you. Thanks, Ideals Books, for the special and surprising treat! you find and review the best most interesting books. are you hosting a reading challenge for 2011?? Just wanted to let you know I'm featuring you and a few other book bloggers on my blog today!